The Metronome – Meet Your New Best Friend! In my last article, How the Pros Practice, I talked about how to optimize your practice time in order to be successful in the studio. I received a lot of feedback about it. Most people thanked me for the valuable information. Others disagreed with my stance, stating that it was too harsh, and that it took the fun out of practicing and recording. In response to these concerns, I can only say “welcome to the music business”! It reminds me of a quote I heard about an adult film director who said: “I don’t pay the actors to have a good time. I pay them to look as if they were having a good time.” It turns out that the music business is amazingly similar! Artists are masters of presenting a certain image and mystique. What they don’t reveal is just how much work goes into making it all look so natural and easy! One of the prime skills to develop as a musician is in playing tightly to a metronome. 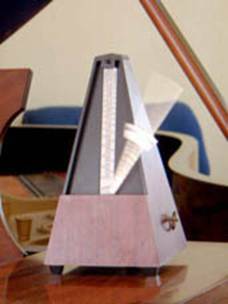 Unfortunately, too many players don’t fully grasp the use and purpose of the metronome. Not only are many individuals uncertain of how to use it, but many people are unaware of why is so important to become very well acquainted with one of the most valuable tools in your arsenal! Plenty of information about how to use the metronome has already been written, so I don’t intend to rehash popular exercises here, but I would like to expand on what the metronome means to us as modern musicians and suggest some tips on how to maximize your efforts in developing tightness. Have a look any “official” music score and you should see it at the very beginning of the piece. The “Heavy Rock” part is a description of what kind of feel the composer is looking for. This is fairly subjective but it helps steer the player in the right direction. Following that is the tempo indication. It states that one quarter note, or one beat, occurs exactly 156 times in one minute. Hence, we would say that this piece is played at 156 Beats Per Minute (BPM). That is great to know, but it would be very difficult to estimate with any precision how fast this actually is. This is where the metronome comes in. Its raison d’être is to provide a audio or visual cue as to how often each beat occurs. Visual cues are usually some kind of blinking light, whereas audio ones could be a beeping or clicking sound. In fact, many modern digital metronomes include both. The typical modern procedure for recording a song goes like this: The band will spend some time playing the song to a metronome to determine its tempo. Once a consensus has been reached, a metronome track will be recorded for guidance. This is what’s referred to as the click track. In digital recording, there is no need to record anything because the click can be set and played during recording and even during playback. When viewed on the screen, each track will be stacked from top to bottom and will extend from left to right. Time intervals can be denoted in time or in bars and beats. These divisions are what’s known as “the grid”. Usually, instruments are recorded in order from the most rhythm-centric to most melodic – E.G. : drums, bass, guitars, keyboards, vocals. However, because of the grid, it is possible to record in pretty much any order. That’s one of the reasons that recording is done this way today. If you have a famous session drummer flying in to do tracking in two weeks, why hold up production? As long as the bass and guitars are in time, they will sync up. For this purpose, a scratch drum track can be recorded using a drum program or machine. This would be replaced later by the real drums. You can see why it would be beneficial to be able to play very tightly to a click! As I mentioned in my last article (How The Pros Practice), amateur musicians tend to shy away from using click tracks because they falsely believe that it will take away the feel. This assumption is based on inexperienced players’ tendency to try to chase the individual clicks rather than feeling the groove of the pulses. Having recorded guitar tracks myself over drums that were not recorded to a click, I’m not sure why anyone would put themselves through the hell of trying to sync up a riff with uneven drums! The truth is that recordings done this way will almost always sound sloppy and will take three times longer to record. The exception is highly skilled players who record everything at once to capture more interaction between the instruments. Unless you’ve done at least ten CDs using a click track, I don’t recommend that you even think about experimenting with recording without one! The fact is that, even bands who do record everything at once or that use an analog system to get that old school warmth, still need to be extremely tight because it is standard practice to have a professional digital editor go over everything to clean up the tracks. When the difference between tight and sloppy tracks can cost in the tens of thousands of dollars, you can bet that no record company would let you put down anything less than near perfect parts. In a live setting, you can get away with playing without a metronome, but you may not have considered all the circumstances that would necessitate playing to a click live. The most common is the dreaded live “speed up” phenomenon which can affect even the most seasoned musicians. A cheering crowd and adrenaline rush can make for a more energetic performance than you were prepared for! The solution is to have the drummer wear an earpiece with a click. The rest of the band don’t need to wear one, since they can follow the drummer. Oddly enough, I haven’t met many drummers, or even whole bands for that matter, who want to do this. They say that it takes too much effort to follow the metronome and it takes away from the enjoyment of the live experience. This is a very interesting response because it highlights the difference between playing for fun and playing professionally. It does take some getting used to, but the difference is a loosey-goosey “bar” band sound versus a tight pro sound. The other common scenarios for using a click live are when sequencing is involved such as time sensitive lighting or sound effects and live recording. If you release CDs, there comes a time when you will want to release a live CD and/or DVD. Just check out most any professional live recordings and I think you’ll find that the playing is surprisingly solid. That’s because the drummer is almost certainly playing to a click! If not, he or she undoubtedly practices to one regularly. I have discovered something interesting about tight players. They all spend a lot of time recording! 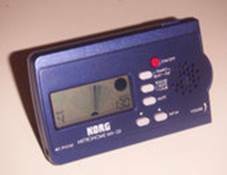 In my early days as a musician, I practiced to a metronome when I was getting ready to record and the odd time that the mood struck me, which wasn’t all that often! This did very little to help my timing at all. It seems that playing along to a metronome will not do wonders for you by itself. At best, it will make your live performances more solid. It was not until I put together a home studio and began to use it every day that I started to see some real progress. Having read interviews and spoken to some of the best players, I have come to realize that the habitual recording to a click is what separates the really tight players from the so-so ones. It acts as a mirror to your playing that does not lie. All too often, players will only hear what they want to hear when playing a part! Recording a part forces you to listen to the sounds that your hands are actually producing as opposed to what you’re hearing in your head. The first step is to play along to the metronome or drum machine for about fifteen minutes or until you feel that the part sounds as noise free and tight as you can play it. After you’ve recorded a few satisfactory takes, listen back to them. If you’re like me, you’ll be amazed by all the ways which the part could sound a lot better than you thought it did! Once you have ascertained what needs to be improved upon, repeat the whole process again and listen a second time. The kinds of changes that I personally would make (as a guitar player) will usually consists of tightening, picking more clearly, eliminating string and position shifting noises, as well as making minor changes to the part to make it sound clearer. This iterative process can continue up to a half-dozen times. Sometimes I come back to a part a few days later as well. Even a pretty good sounding part will improve with a couple more sessions. In other words, you can always play tighter and better! Tightness is not just about following a click track to a very exacting degree, but it is also about clearly enunciating each note and making what’s in your head come across on “tape”. The tightest players happen to be the ones who spend a lot of time working on this very skill. Whether you’re a hobbyist or a full-time pro, you can’t go wrong by recording yourself over a click track – often. Until next time, happy practicing! Rob Gravelle recently embarked on a solo music career, after playing since 2000 with Ivory Knight, a band rated as one Canada’s top bands by Brave Words magazine (issue #92) and who released two CDs. In 2007, Rob recorded the KNIGHTFALL CD in collaboration with the former Ivory Knight vocalist and legendary guitarist/producer, Jeff Waters of Annihilator fame. Check out Rob's website.